What at one point seemed like a good idea has turned into a major undertaking. It is about 4 days until Race Day 1. The past couple of weeks have been filled with gathering gear and information, reading about racing rules, preparing the kids for a week at Grandma’s and figuring out provisioning for a week on the water – without a fridge or a stove. 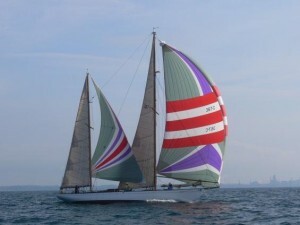 As we sit here on June 25 – Felicity is out of the water, mast down (thanks again Brian) and she’s all set to go. Me? Not so much all set! Basement floor is covered with random things scattered all over – life buoy, radar reflector, new PFDs with harnesses, jack lines, tethers, water tight flashlights… the list goes on. 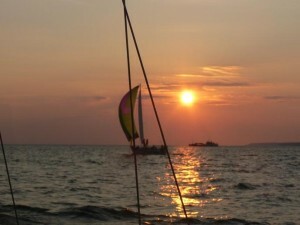 The plan is to launch in the Presque Isle Bay on Friday, June 27. Race starts bright and early at 5:30AM (for the Rally class) on Saturday, June 28. So much for our idea to cross the start line dead last to stay out of everyone’s way – we’re on first. Today we: said good bye to the kids, drove Felicity to Erie, launched, put up the mast (kind of twice), made it to EYC and found our spot for the night… Skippers’ meeting was less-than confidence boosting. 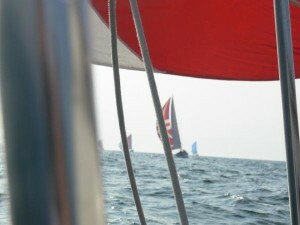 Bottom line – tomorrow at about 4:30 am, there will be us and about 54 other boats scrambling for the start line. Start was fast and furious but well under control. 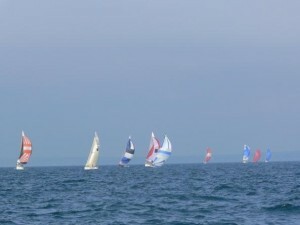 We started and went towards the weather mark, with 3 ft waves and 10-15 knot winds with white caps. It was an awesome ride! Felicity was jerking all over the place with waves crashing on the bow. This is what I came here for! 10 pm. We are beat and going to bed. Went to dinner at Port Dover Yacht Club and awards ceremony. Dinner was not bad, a little wet, as it poured on us. Awards – different story. What?? No flags for the rally fleet? So unfair. 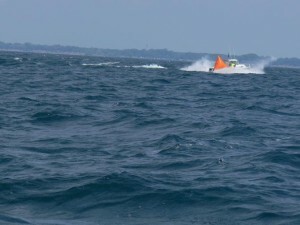 Smallest boat-slowest boat//The only boat w/ outboard motor (although later we found one more)//No spinnaker boat//Most inexperienced crew//One of the only 2 boats with woman skipper//Youngest skipper (my guess)//Least amount of people on board 9:35 am. We are hitting 5.5-6 knots consistently. Just saw 6.69 – way to go Felicity! 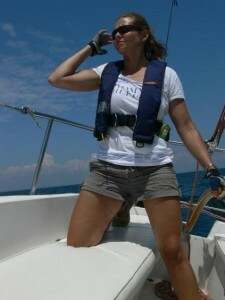 Change at helm. times we were sideways to the waves and some of the times we seemed to be vertical. Felicity was surfing the waves, breaking 11 knots. She was close to impossible to control, and it remained like this for the rest of the afternoon. Then, we almost missed the finish line. We couldn’t even take the damn sails down – I am still not sure what happened there. A little while later we docked, exhausted, thankful to be unhurt. We were later told that the wind was sustained at 30 knots and people saw gusts over 40, and the waves sustained at 10 ft. Bill and I did it, and we did it well! That entire evening we had visitors stop by – admiring us, congratulating us (on survival I think) and telling us we’re plain crazy. At the dock, we drank our special champagne. That was one heck of a day and will long live in our memories. Today’s race went pretty quick and was a comfortable ride at 15 knots. Then came the hot dogs and burgers, and then came the awards ceremony. The room was full of sun burned tough guys. As the flags went out, I was hoping to get something, anything – to bring home to the kids. After all we came in 2nd overall in the Rally class out of the 4 boats that started. So then we did get something – as the 1st runner up, we got some cool beer mugs and a nice plaque. That was nice and all. 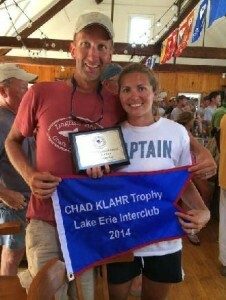 And then they talked about the special award… in honor of Chad Klahr who loved to sail and died young of cancer. This was an award for the best spirit and love for sailing represented during the Interclub and presented by Chad’s Family… There was more said, but I can’t recall – Diane did a great job with a touching speech. The room was quiet. And then that award went to “this little boat that came all the way from Lake Pymatuning”. This award was worth every ounce of fear out on the lake yesterday. I’m trying to hang on to the memories from that moment. Bill pushed me to go get the flag, and then followed me. I did all I could to stop the tears that filled up my eyes. The room went crazy, and Bill said it was by far the loudest round of applause. We took pictures, shook hands; people said “great job” left and right. I’ve never been more proud to receive an award. Really? We did it?? The flag is proudly flying between Felicity’s shrouds. She deserves is as much as we do. All was well this morning as we started our journey home, looking for some breeze out on the lake. First crossing alone! We are to meet a friend for dinner in Dunkirk, and then see the kiddos tomorrow! So, as we set off, truly alone out there, we hear on CH 16: “Tornado warning for western Lake Erie is in effect, to affect water on the rest of the lake.” WHAT? Really? This is how I got to talk to the Coast Guard, on the radio, for the first time in my life. Then, we heard this: “Seek shelter immediately, return to the nearest port.” So, maybe we’re not going to Dunkirk. After a few hours of watching the sky intensely back in Point Abino, we felt comfortable enough with the radar that we made the quick run back to Port Colborne for the night. The trip only took about 2 hours of motoring, but was nerve wracking as the lake still looked gloomy and nasty. Evening in Port Colborne was very pleasant though. We visited the Welland Canal, ate good food, met more cruisers and shared stories over a bottle of wine. 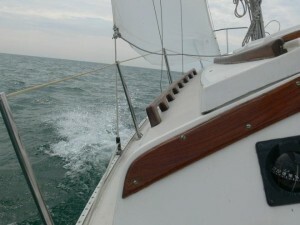 Today we sailed about 60 NM from Port Colborne to Erie – one heck of a long day. What started at 7 am with a comfortable north wind at 10 knots; had turned into a wet, cold, windy day as the wind shifted to west and picked up to 18. The waves built up quickly and kept at 3-4 ft for the rest of the day/evening. We got home (Erie) safely, around 8 pm, wet, cold and hungry. Then, after a 2 hour adventure with customs, we found this joint to eat something. It’s almost 10 pm and I’ll be happy for some food, dry clothes and sleep. Cheers. I am very sad that this adventure is over. We met amazing people along the way and visited beautiful places. 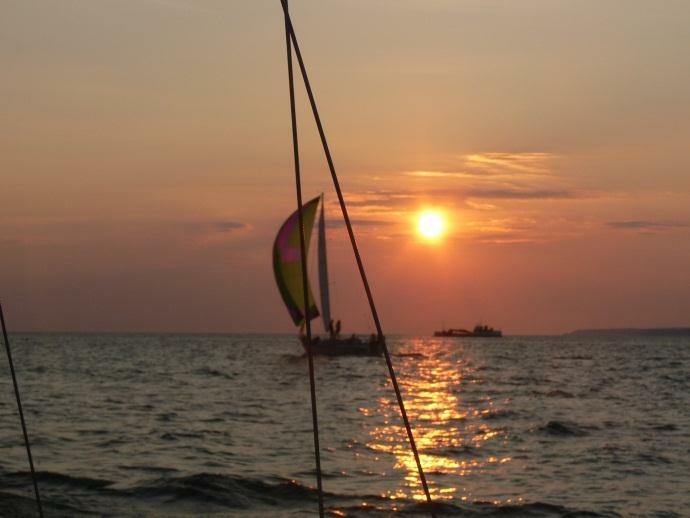 Sailing life is a good life.